The Scikit-learn Python library, initially released in 2007, is commonly used in solving machine learning and data science problems—from the beginning to the end. The versatile library offers an uncluttered, consistent, and efficient API and thorough online documentation. NumPy, a library for manipulating multi-dimensional arrays and matrices. It also has an extensive compilation of mathematical functions for performing various calculations. SciPy, an ecosystem consisting of various libraries for completing technical computing tasks. Matplotlib, a library for plotting various charts and graphs. Scikit-learn offers an extensive range of built-in algorithms that make the most of data science projects. Here are the main ways the Scikit-learn library is used. The classification tools identify the category associated with provided data. For example, they can be used to categorize email messages as either spam or not. Regression involves creating a model that tries to comprehend the relationship between input and output data. For example, regression tools can be used to understand the behavior of stock prices. The Scikit-learn clustering tools are used to automatically group data with the same characteristics into sets. For example, customer data can be segmented based on their localities. Dimensionality reduction lowers the number of random variables for analysis. For example, to increase the efficiency of visualizations, outlying data may not be considered. Model selection algorithms offer tools to compare, validate, and select the best parameters and models to use in your data science projects. The Scikit-learn preprocessing tools are important in feature extraction and normalization during data analysis. For example, you can use these tools to transform input data—such as text—and apply their features in your analysis. Let's use a simple example to illustrate how you can use the Scikit-learn library in your data science projects. These commands import the datasets module from sklearn, then use the load_digits() method from datasets to include the data in the workspace. The datasets module contains several methods that make it easier to get acquainted with handling data. In Scikit-learn, a dataset refers to a dictionary-like object that has all the details about the data. The data is stored using the .data key, which is an array list. For instance, we can utilize iris.data to output information about the Iris flower dataset. Let's also use iris.target to give us information about the different labels of the flowers. If we use iris.target_names, we'll output an array of the names of the labels found in the dataset. We can use the box plot to produce a visual depiction of the Iris flower dataset. 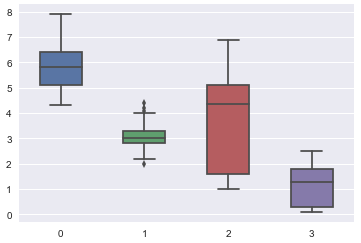 The box plot illustrates how the data is distributed over the plane through their quartiles. The vertical axis is dimensions in centimeters. Here is the entire code for this simple Scikit-learn data science tutorial. Scikit-learn is a versatile Python library you can use to efficiently complete data science projects. If you want to learn more, check out the tutorials on LiveEdu, such as Andrey Bulezyuk's video on using the Scikit-learn library to create a machine learning application. Do you have any questions or comments? Feel free to share them below.